Win A Kona Brewing Company Branded Paddle Board! Home » News » Win A Kona Brewing Company Branded Paddle Board! One lucky winner will win this Kona Stand Up Paddleboard during the Ta-Hoe Nalu Paddle Festival weekend. Be sure to stop by the Kona beer garden for a little Liquid Aloha and enjoy Longboard Lager, Big Wave Golden Ale, Castaway IPA and Lemongrass Luau Blonde Ale! 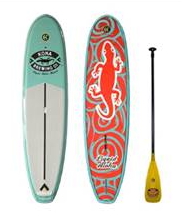 This 10’6” C4 Waterman Gecko Stand Up Paddle Board features a single, center fin box with plastic dorsal fin. One (1) adjustable Fiberglass Paddle included. Board weighs about 40 lbs.